A backpacking trip that almost transplanted me back to good ole Switzerland: Spider Meadow has a very alpine look, with an open meadow down in the valley, flowers and marmots galore, surrounded by rugged mountains on either side and waterfalls pouring off the cliffs. 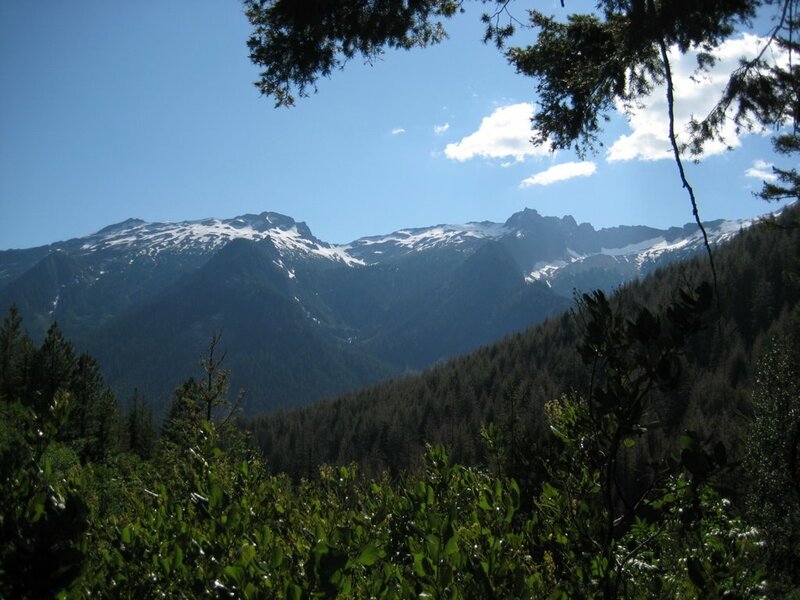 Big difference to hiking in the Swiss Alps: here in the National Forest, one can readily camp in the backcountry. I even found a camp site made in heaven, more below. 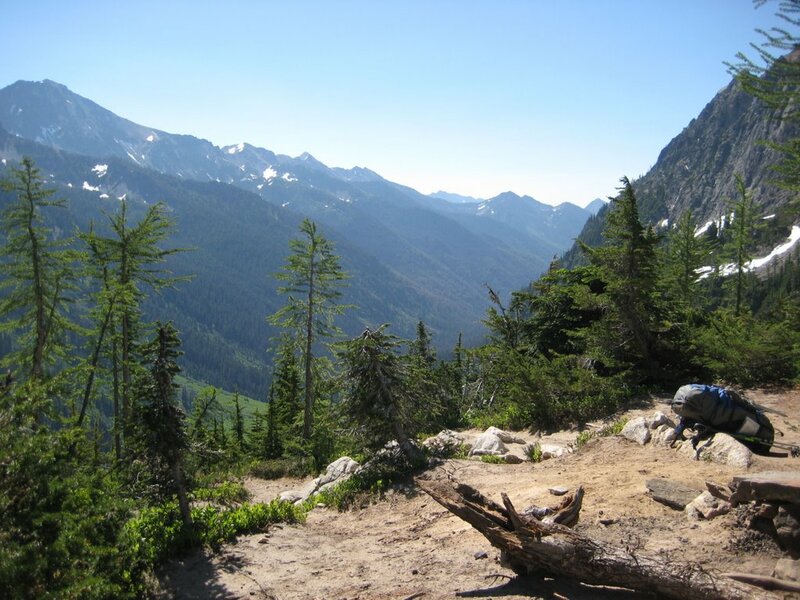 I got to the trailhead of Phelbs Creek trail (#1511 in the Wenatchee National Forest) around 4pm. I wanted to enjoy plenty of daylight to search for a site and setup camp, so I rushed the first 5.5mi up to the beginning of the open meadow. That part was (as expected on a weekend) already quite populated and no sites were available anymore. Following advice of the WTA trail description, I had planned to find a more private site at the far end anyway. Halfway through the meadow, I had an interesting chat with a NF ranger who indicated that there might be still some available space along the trail up to Spider Gap or Phelbs Basin. I decided to venture all the way into the Phelbs Basin. 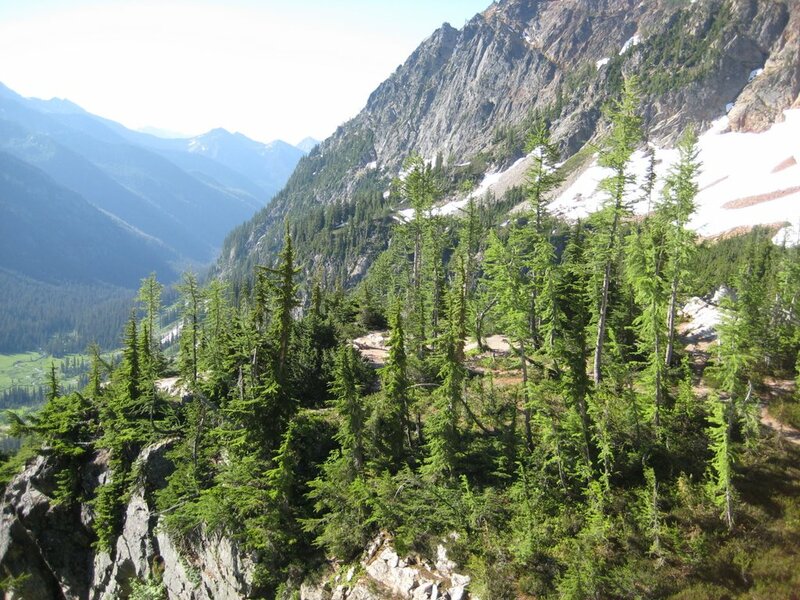 Once I cleared the tree line, a gorgeous river valley opened, with no one else in there and several camp sites. So after 7+ miles from the trailhead, 1500ft higher and 2.5 hours later, I had my place for the night. Dinner was a good serving of Polenta (from scratch, 1/2 cup coarse ground cornmeal, broth, water, added dried & cut tomato, freshly roasted pumpkin seeds and a dash of cayenne). After waiting and watching the moonrise lighting up all the mountains around me and its bluish light eventually making it into the basin and my camp, I snuggled into my cozy sleeping bag for the night (~38F, clear sky). 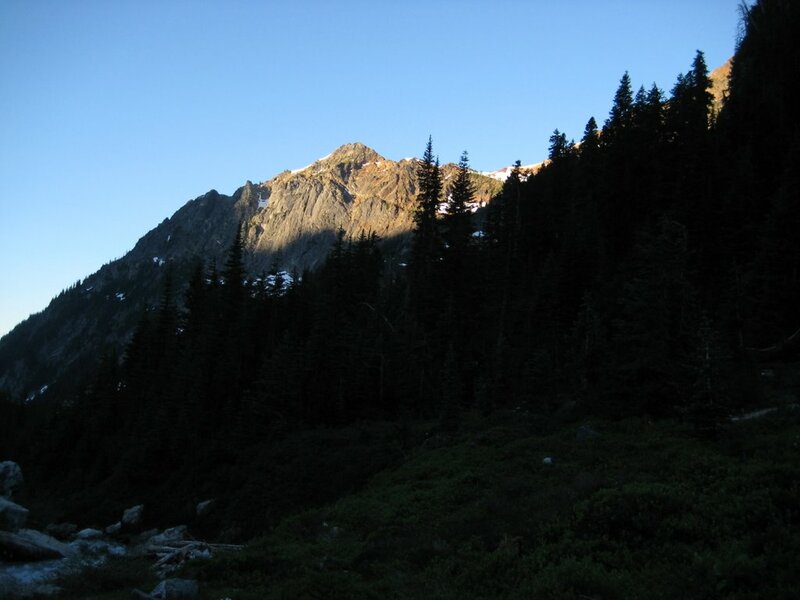 The next morning, I got up around sunrise (5:30) and prepared breakfast (fast cooking oatmeal, brown sugar, cinnamon, mixed with dried cherries and cranberries), pumped water to refill my camelback, broke down camp and was on the trail around 7:00. On a steep trail, I hiked out of the meadow valley up to the lower end of the Spider glacier (climbs 1000ft in ~ half a mile). At the bottom of the glacier, situated on a knob, I found the most fabulous camp site, overlooking the whole valley as if it were a balcony. A real room with a view! Next time I’m up in Spider, this will be my camp site of choice! 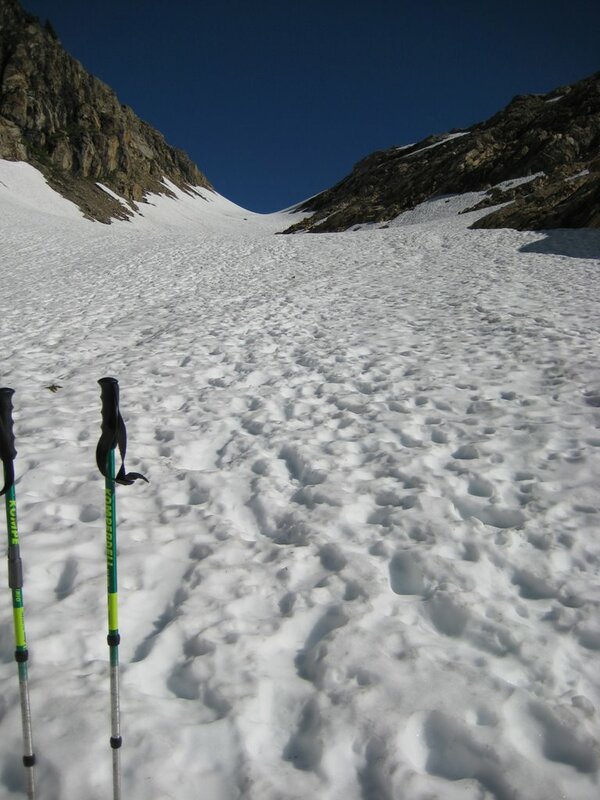 Right behind the camp site, the Spider Glacier snowfields start, leading up to the Spider Gap. The next ~1000ft over a .75 mile, I spent with plenty of kicking treads. Up at 7100ft, a splendid view over to Lyman Lake was the reward. Enjoyed a second breakfast and admired the view before starting my hike back to the car. Descending back over the snowfield is a joy: some glissading and long strides take me back down to the Spider knob camp sites in ~10minutes. Another 30min later, I’m back in the Spider Meadow valley. Time to hike out: Hiking back to the trailhead was mostly on autopilot, but on the final 3 miles, my feet develop several painful blisters. 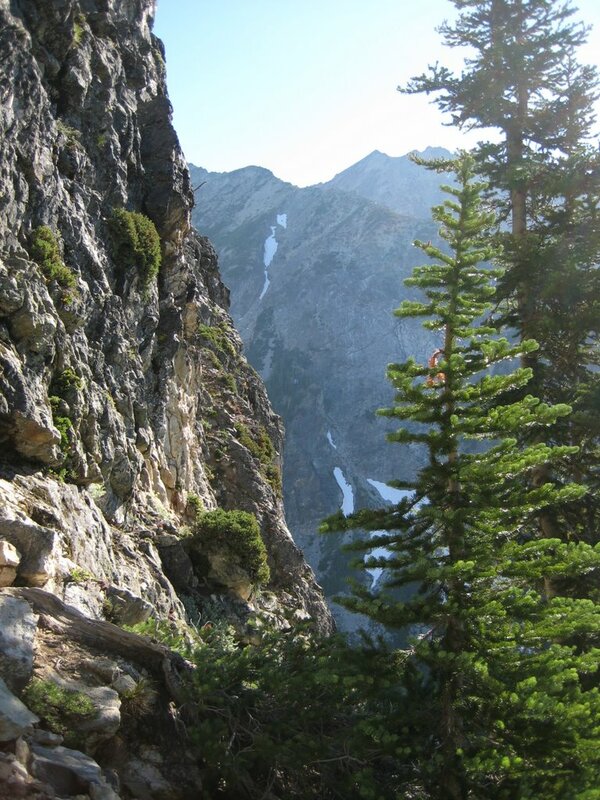 Hot weather and hiking on snow got my feet wet from the inside and the outside, causing hot chafing on the skin. Lesson learnt: Must pack a spare pair of dry socks next time. The last 2 miles were a real exercise in endurance and pain tolerance… Back at the trail head, what a relief to finally get out of my boots. A happy but tired David gets back on the road for the 2.5 hours drive back home. Soon after getting onto US-2 again, the unexpected happened: My truck’s front left tire blew, followed by a 30minutes “pitstop” in 90 degree searing sun, seeing me kneeling on hot concrete and manhandling the heavy truck (spare) tires. Still not clear what caused the tire to fail. Rough road just to get to the trailhead at 3500ft. At the trailhead, first glimpse to Buck Mtn? The first 5 miles snake up through a light but shady forest. Pitched my tent for the night in Phelps Basin, all by myself. A sneak peak up to Red Mountain. Trail climbing out of the Meadow valley to Spider Glacier. Great view back down to Spider Meadow, looks very alpine. 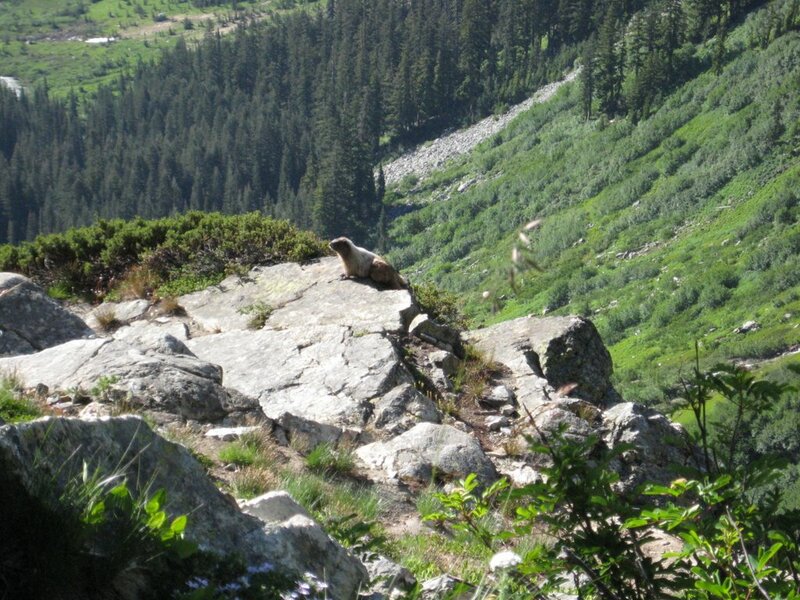 Company: A marmot cautiously following my every move. 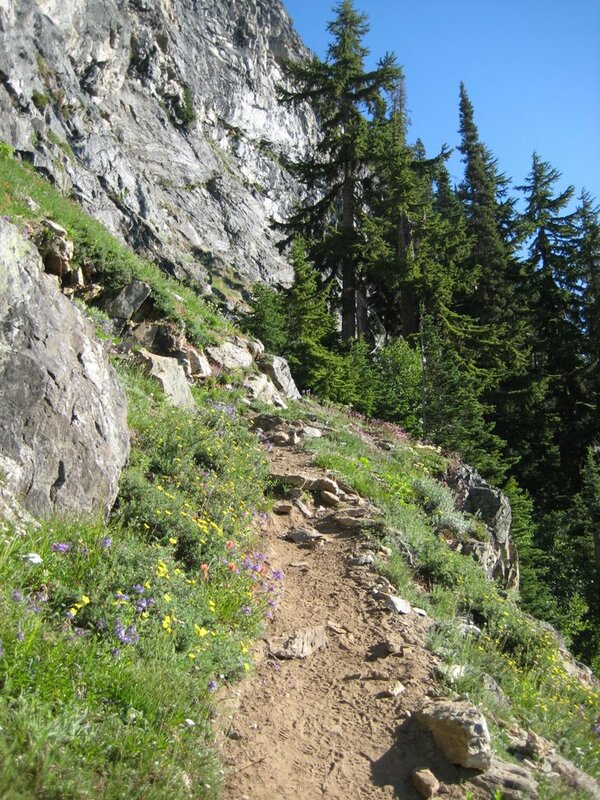 Parts of the trail are not for the faint of heart, but the trail is well maintained and safe to hike. Camp site made in heaven! This balcony offers a splendid view down to the Meadow; next time in Spider Meadow, I’ll venture the extra 40 min to get up here! 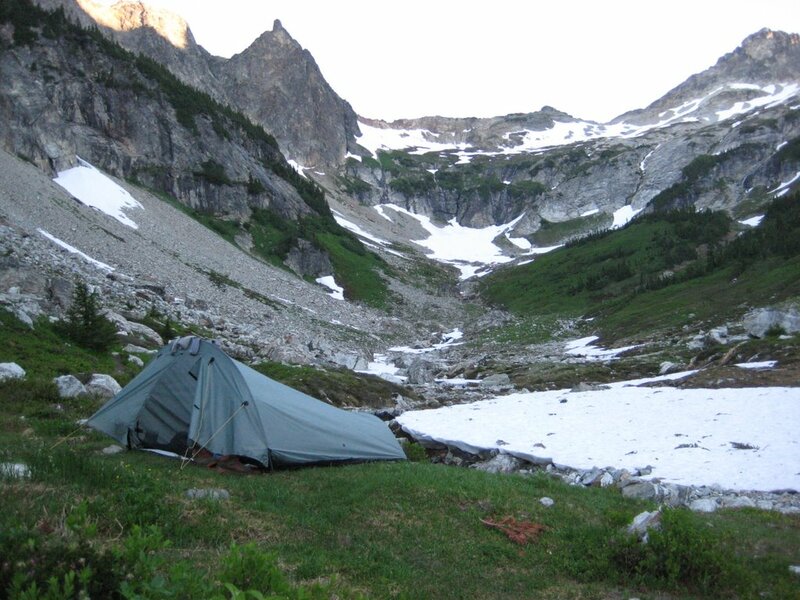 View from the gorgeous camp sites at the bottom of Spider glacier. Gulp! More than a 3/4 mile of toe kicking snow and ice is waiting for me. Spider Gap is behind the saddle at the far end. Made it! 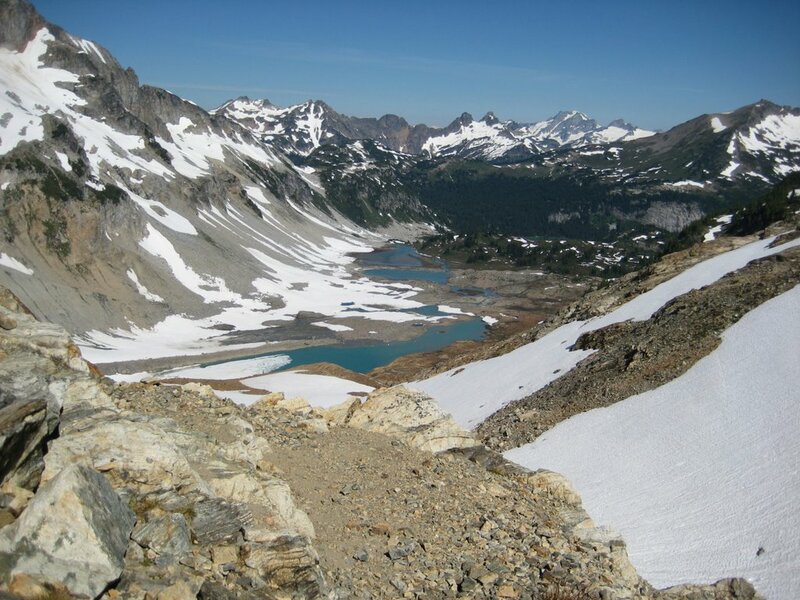 View from Spider Gap to the other side, Lyman Glacier with Lyman Lake, Cloudy Peak behind. 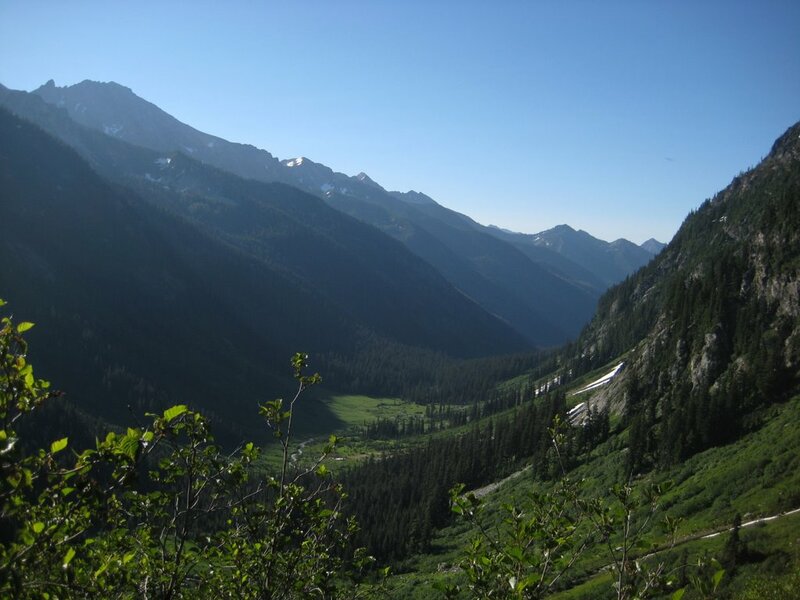 Drive US-2 beyond Stevens Pass and turn north on Lake Wenatchee Road (Highway 207, milepost 81), near the town of Coles Corner. 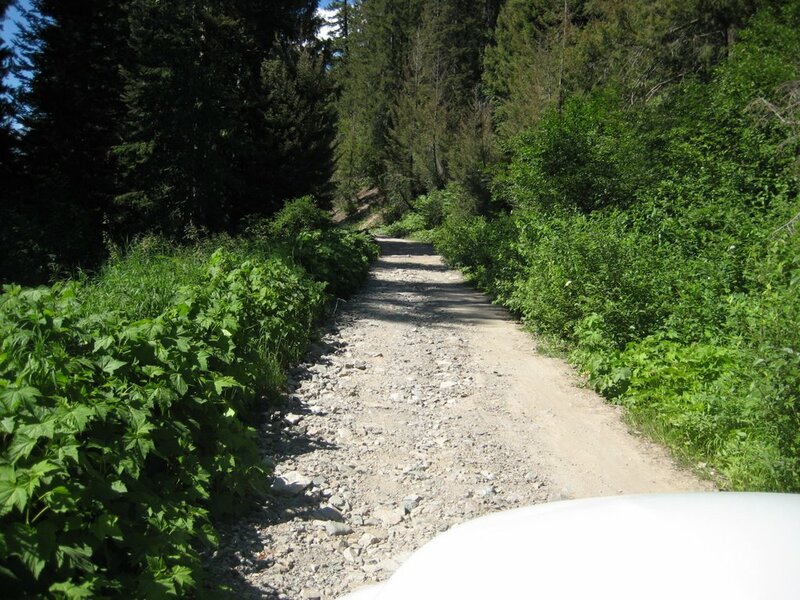 At 4.3 miles, after crossing over the Wenatchee River, take the right fork to Chiwawa Loop Road. After 1.4 miles turn left onto Chiwawa River road (FS62/6200). 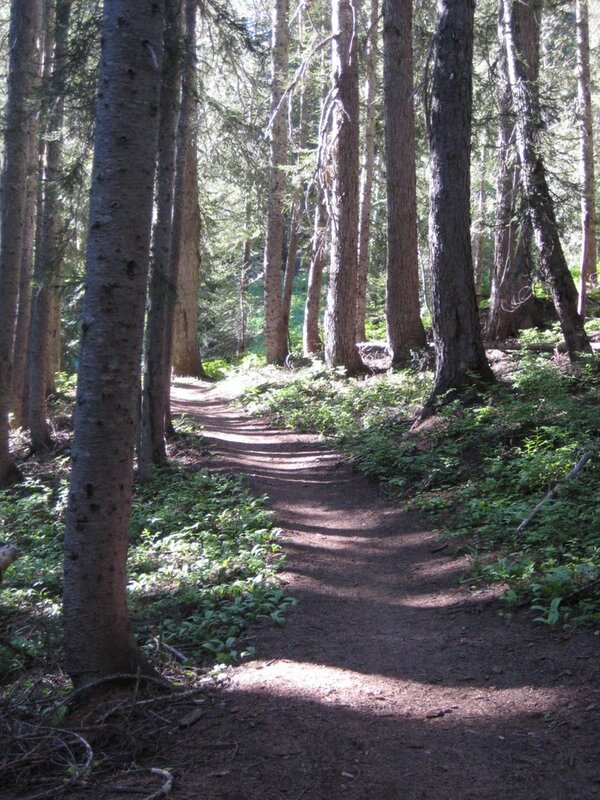 At 28.1 miles take right fork to Phelps Creek trailhead (FS6211). At 3.4 miles and 3500′, park your car with ALL the others.